Option 1: main menu > Submit or manage support cases. 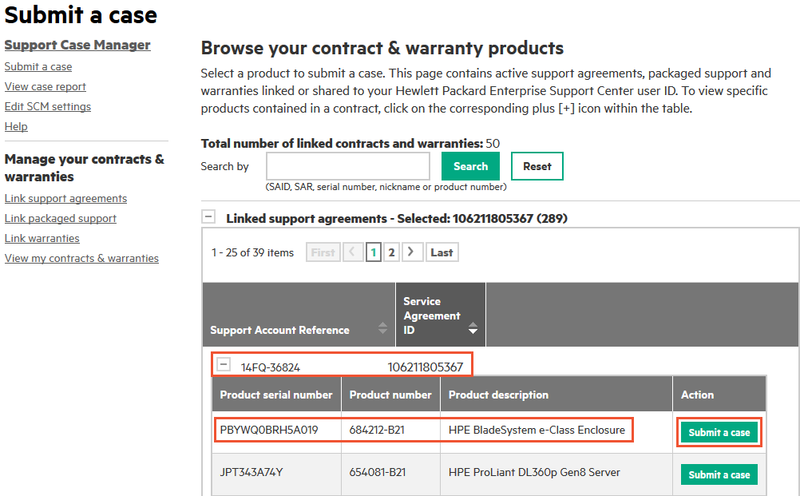 Option 2: On the HPE Support Center homepage, click Access Cases. Option 3: Navigate directly at: www.hpe.com/support/scm. Browse to SCM or if you are already in SCM, click Submit a case in the left menu. The list includes contracts that are associated with your profile, or that are part of a contract and warranty share that has the SCM role enabled and that includes you as a member. Expand the contracts in the list to see the products covered by each contract. Find the product in the list and click Submit a case on the right. Note: Datacenter Care customers: If you use a Principal SAID to submit a case, enter the device serial number in the Problem description field. If the identifier is valid and the contract is active, a list of products covered by the contract appears. Find the product in the list then click Submit a case on the right. If you are signed in, a contract does not need to be associated with your profile to submit a case for a product covered by the contract. From the Submit a case page, enter a case title, operating system and version, vendor, severity, and provide as much detail as you can. Describe the problem and the steps you have taken to resolve it. Click Problem description for examples of information to provide. Identify third-party options installed and if they have been eliminated as potential causes. Identify system options installed, regardless of whether they seem pertinent. Total memory including RAM size and configuration. Installed patches and service packs. Revision levels (if a hardware or firmware problem). Has this problem been previously reported to HPE for the same product? If so, include prior support case numbers opened for that product. Actions taken by HPE, any service provider or the customer since the first occurrence of the problem. Can you reproduce the problem? If so, include the exact steps to reproduce it. Include crash analysis if a system crash. Contact information is used by the support agent to communicate updates and request further data. Ensure the contact is the person who can actually work with the support agent. Be sure the equipment location is accurate, as on-site visits and parts delivery are made to this address. Click Troubleshooting steps taken for examples information to provide. What were you trying to do when you detected the problem? What error messages did you see? What programs, commands, or devices were involved? When did you first observe the problem? When was the last time the activity worked? What has changed since then (hardware, software, configuration)? If the problem is intermittent, under what conditions did the problem occur? If you submit a case within the contract's coverage hours, the first available support agent will respond. For support outside of the contract's coverage hours, submit the case by phone and say that you need an "uplift" to your support contract. This will result in an additional charge. Uplift is not available in some countries. For onsite support, response time depends on the type of contract. Onsite response time is the time an engineer will be onsite to address the problem, not problem resolution time. Enter it into the Check case status box and click Go. This displays a case summary below the text box, including the case status. To see more details, click View case details. Browse through the My recent cases table to locate your case. When you locate your case, click the case ID. You should now be on the Case information page, which shows a summary of the case and includes a complete case history. You can create a list of cases submitted on products covered by contracts that are associated with your profile, or that are part of a contract and warranty share that has the SCM role enabled and that includes you as a member. On the SCM homepage click View case report. On the Specify case report settings page, select one or more contracts from the list and add them to the box on the right. You can also search for a specific contract or warranty. Enter the contract or warranty into the search box and click Find. This will highlight it in the list below. Optionally, filter the cases by case status and time frame. The report lists cases associated with your profile, and includes: case ID, case title, serial number, status, severity, submitted and updated dates, and the customer tracking number. Click a case ID to view details for the case. Optionally, click the CSV icon to download the case report in CSV format. To modify the report, click Change report settings. 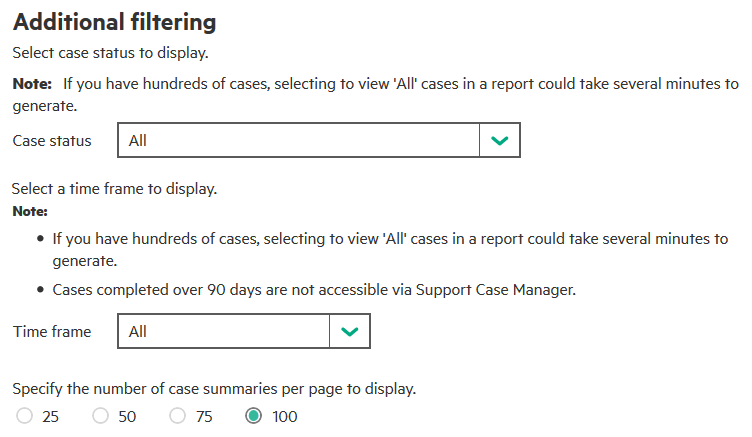 Enter the case ID in the Check case status text box on the SCM homepage, then click Go. Click the case ID in My recent cases table on the SCM homepage. Click a case ID in the report generated by View case report. Case information including case title, customer tracking number, contract and product numbers, source (web, phone), submitted and updated dates, and current status. Case history, which includes correspondence and case logging information. You can add comments and attachments to open cases, and close cases. Navigate to the Case information page using one of the methods detailed in View your recent cases. On the Case details & history tab, click Update, add attachment or request to close this case. In the text box, add comments and click Update. On submission your comments are added to the case history and the support agent is informed. Email pertinent documents such as program files, log files and illustrations to open cases by using the email link on the case details or case submit confirmation pages. Do not modify the email subject line. The attachments are added to the case and the support agent is notified. You will receive a confirmation email when they are processed. You cannot access documents attached to a case through Support Case Manager. For security reasons, send the email from the same domain address as the domain of the case contact's email address, if possible. (The domain is after the @. For example: @mycompany.com.) Email delivery time is not guaranteed. In the text box, enter a brief explanation of why you want to close the case, and click Update. Cases are not automatically closed as the result of a request. A support agent closes the case after reviewing the request. If you submit cases on a regular basis, it may be convenient to prefill contact and preferred equipment location values, and specify their source. In the left menu, click Edit SCM settings. The contract you are using to submit the case. The contract you are using to submit the case, and your HPE Passport profile, and the contact data used the last time you submitted a case. Do not prefill: Use when the contact data changes frequently or when you use the contact drop-down list to populate the fields. Prefill from your HPE Passport account: Your name and contact information. Use last entered data: Useful when the same contact information is used every time. Use data from support agreement: The contract you are using to submit the case. This is useful when the contract includes the contact person who is dedicated to handling cases with HPE. Click Save to make the selected options become your new default settings. Note: Customers with PIN codes, such as Datacenter Care customers, must add the PIN code to their profile before submitting cases. In Edit SCM settings, add the code in the "Support Case Manager PIN" field, and save. Effective 19 March 2018, HPE will discontinue technical support in Danish, Swedish, Finnish, Norwegian and Dutch and will instead provide support in English. When you contact HPE for technical support, either online at HPE Support Center or on the telephone, English will be the language of communication. HPE may continue to modify language support in the future. Any such changes will be noted here.